I was surprised and really pleased that Glenn Greenwald landed two major news scoops this week on the unbounded national security/surveillance state. The New York Times and Washington Post still have their share of big stories, but nothing much lately. As some anti-journalism conservative sites have pointed out, few of the big stories this year have actually be exposed by real news organizations. There never was a real story over Benghazi (other than the initial tragedy itself). All media coverage in the past few months has been of the entertainment nature, covering the hearings in the House (while ignoring them in the Democratic Senate) which failed to reveal any new information. All coverage of “MemoGate 2” ceased when the White House released emails which backed the administration’s version of events and showed the controversy to be politically-driven campaigning with no wrong-doing to be found. Never mind the fact that all the scandal that the GOP thought they had found revolved around which part of the executive branch was responsible for edits to talking point memos meant to guide officials in speaking to the press. The media covered the initial tragedy, as it should, as a breaking event. But other than that after everything we’ve seen through these investigations, there was little else for the media to do after the first couple of weeks. Few media organizations seem genuinely upset over the spying on the Associated Press, mostly because they didn’t care when laws were changed during the Bush administration which greatly expanded the surveillance state that enabled this behavior in the first place. Even if they did care, they’d have to acknowledge that they stood by and did nothing years ago, and then end their corrupt relationships with government officials which would put an end to all the squirt gun parties and cookouts. And the AP didn’t break that story so much as they were told by the Justice Department directly that they were spying on them. Weeks later, there still hasn’t been any evidence of actual wrongdoing revealed in the so-called IRS scandal, other than the inconvenient discussion about how so many 501(c)(3) organizations are engaging in political advocacy illegally while the IRS does nothing about it, and politicians turn around and pressure the IRS to drop badly needed investigations into such activity. Examples of notoriously political 501(c)(4) and (3) organizations likely breaking the law are Karl Rove’s Crossroads GPS, the NRA, AIPAC, and even President Obama’s own Organizing For America. Crossroads GPS and its parent, American Crossroads, spent $51 million in 2011 alone, a non-election year, and because of its abuse of the law, is not required to disclose its donors. Both organizations spent at least $174 million on the 2012 President election, all to benefit Republicans and conservative political policies only, and raised at least $300 million for the entire election. Much of that money went to television ads attacking Barack Obama and Democratic candidates. Crossroads spent $11 million to elect George Allen in Virginia last year, $6 million to elect Josh Mandel in Ohio, and $4 million to elect Connie Mack in Florida. All three candidates lost. Rove is so unafraid of having his organizations prosecuted for breaking the law (or even having their applications denied) that he formed a new PAC earlier this year which has the sole purpose of knocking ultra-conservative Tea Party candidates out of GOP primary elections and publicly bragged about it. When it comes to tracking the activity of these ultra-secret and most likely corrupt “social welfare organizations”, most of the work is being done by underfunded and little known legitimate 501(c)(3) organizations like the Sunlight Foundation, not the mainstream media. And from what I gather, the only reason the media caught on to the internal IRS investigation is because the IRS planted a question with a reporter. The only people who seem to care about real news are public advocacy organizations like ProPublica, Frontline, and people like Glenn Greenwald, and a few good journalists still at the Times and Post. * Money, Power & Wall Street, a four part series on the global financial crisis. The single best source of information on what happened and why. * Inside Obama’s Presidency, his first four years including his role in responding to the financial crisis and the fiscal cliff. * Climate of Doubt, “When President Obama tried to push for legislation on climate change during his first term, he encountered such fierce political opposition that it quickly became clear Congress wouldn’t be the avenue to reform.” This, despite the overwhelming worldwide scientific consensus on Anthropogenic Global Warming. * Inside Japan’s Nuclear Meltdown, The disaster that everyone has already forgotten. * Nuclear Aftershocks, “Frontline travels to three continents to explore the debate about nuclear power: Is it safe?” Begins in New York’s Indian Point nuclear power plant, responsible for almost 25% of the state’s power, which sits 35 miles from Times Square which has no evacuation plan. As of air time, only six of Japan’s 54 nuclear reactors were still running, and all were projected to be offline within months because of fear over the Fukushima Daiichi disaster. I think that Glenn is really what people think about when they talk about “citizen journalists”. 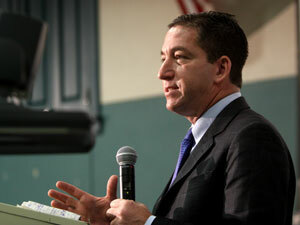 His primary work has been op-eds and essays about civil liberties, and political and media corruption. It was through that work that he gained access to whistle-blower information which gave him the ability to report on controversial government programs as a journalist. His advocacy and passion put him in the right place at the right time to do the job. Glenn did more in the last week to inform the public of government malfeasance than Fox News, CNN, and MSNBC have collectively done in their entire sad existence. I only hope that when they go after him, and they will, that his fate is less awful than that of Bradley Manning, Julian Assange, James Risen, and Daniel Ellsberg.